BEIJING, Nov. 27 (Xinhua) -- Chinese Premier Li Keqiang on Tuesday said that China and the Republic of Korea (ROK) should make good use of platforms such as the governor meeting to enhance communication and cooperation, and advance bilateral ties. 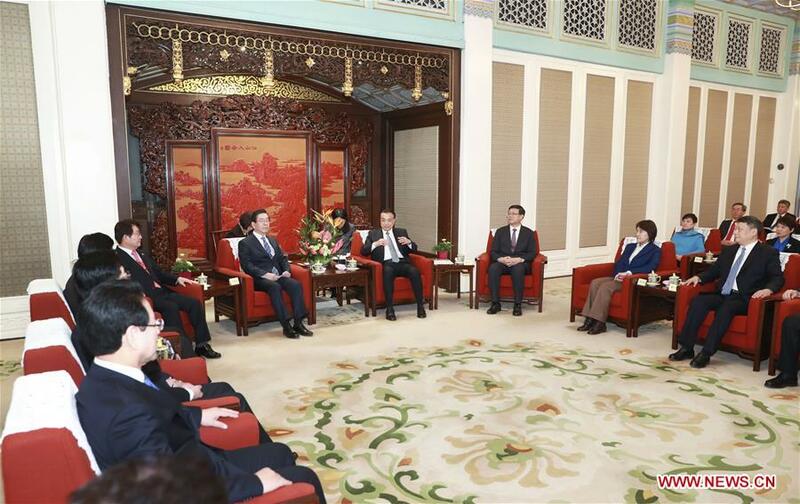 Li made the remarks when meeting with 17 participants of the second governor meeting between China and the ROK. Commending the stable development of bilateral relations, Li said trade and investment between China and the ROK had increased rapidly and had broad growth space. "China stands ready to work with the ROK to push forward a long-term and stable development of bilateral ties in line with the principles of mutual respect, equality and mutual benefit," he said. The governor meeting between the two countries has yielded positive results, especially in facilitating in-depth exchanges in fields such as people-to-people and environmental protection, which shows that local governments of the two countries have strong will and there is great potential for cooperation. Representatives of the ROK congratulated China on the great development achievements it has made over the past 40 years of reform and opening-up. They said the achievements not only benefited China, but also promoted peace and prosperity in Northeast Asia. They said the ROK is ready to work with China to cement trade and investment cooperation as well as people-to-people exchanges, enhance cooperation between local governments, activate folk exchanges, and make new contributions to the development of bilateral relations.